Well, I'm officially due a month from today! So in addition to finalizing our short list of names, I've also realized that we better get the nursery finished. We've slowly been accumulating second-hand items from thrift shops, Craigslist, and friends, but now we need to put it all together. At Thanksgiving we had both sets of parents come visit us in Squamish, and my in-laws brought out a bunch of furniture from the Okanagan that we had been saving. First up is an old dresser that actually belonged to my brother and was in his nursery 24 years ago. I used some leftover paint from the sewing centre that my father-in-law made me for my birthday this year to freshen it up. Sitting on top is my half-assed attempt at a vignette. Well, not really... The stuff is just sitting there until I get shelves put up, lol. I need to glue hooks onto the back of the 3 photo frames (purchased for $2.99 a pop at a thrift store on Vancouver Island). I'm thinking of putting either some of my hubby's photography in it, or some of my SIL's prints. The pink teddy bear was mine as a baby (I clearly need to fix her smile! ), and the Beatrix Potter tin was a gift from an English family friend when I was about 8 or 9. See? Hoarding can be beneficial! The bag is actually a makeup case that my SIL gave me as a bridesmaid gift this summer, but as it's lined in PUL and I already have about 5 makeup bags, this will be perfect as a small wet bag for quick trips out with babe! The change table is actually a Swedish antique that I picked up at an antiques dealer near Vernon last year. It got pretty badly scuffed during our move to the coast (see photo below), so I brightened it up with the same robin's egg blue paint as the dresser. We still need to install a shelf above the table to store diaper cream, etc. but that is a quick project. Oh, and the bin beside it is a cloth diaper pail with a wet bag inside - both second-hand from a friend in Vernon. Every nursery needs a rocking chair. This chair belonged to N's grandmother, who apparently used it to rock my mother-in-law to sleep when she was a baby in the 1950's. I'm planning to make some cushions for it so it will be nice and soft for whoever gets to rock baby to sleep (uhhhh most likely me!). I made the paintings a few years ago and love the colours. Here is a sneak peek of the fabrics I'll be using to make the crib bedding... They just arrived in the mail yesterday - I ordered them off Fabric.com. MUCH faster shipping than the spring when Canada Post was on strike, lol. I'm planning to use Sew4Home's Pleated Crib Skirt tutorial with the owl fabric as the main, and chevron for the accent. The cushions for the chair will also be from the chevron fabric. Speaking of Sew4Home tutorials... I used their totally awesome (and free!) Pretty Bird Quick Trip Diaper Bag tutorial to make a diaper bag that was both mom and dad friendly! I bought this medium-weight cotton twill at Dressew several months ago, always intending it to become a diaper bag. 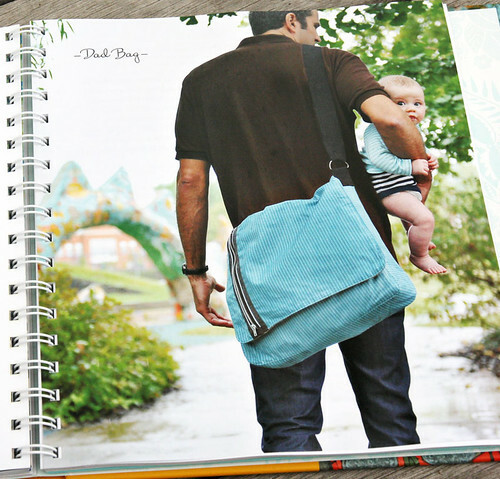 Originally I wanted to make the Dad Bag from Anna Maria Horner's Handmade Beginnings book, but opted for the Pretty Bird bag since it seems to have more storage. Neither bag seems particularly giant though, which is good. I also already have a messenger-style bag that I got from work as part of Vancity's 65th Anniversary celebrations (woohoo!). It matches our red and grey stroller perfectly - ha! The Sew4Home tutorial was very easy to follow, and luckily I had all "the ingredients" already on hand... with one exception. I didn't have any fusible fleece, and since there are no fabric stores in Squamish (well, apparently Walmart sells notions but I didn't feel like driving there to check if they had it). I really am getting lazy these days! Instead, I used part of an old thermal fleece blanket and then quilted it to the plaid (I used black thread and just followed the design in the fabric). The inner fabric is actually upcycled from a pair of pants that my hubby bought at a thrift store and I converted into shorts for him. The extra fabric was from the discarded lower pant-legs. Bonus points for thriftiness! I also had 2m of PUL fabric that I ordered online from Fabric.com earlier this year. I hope to make a few newborn sized diaper covers out of the leftovers. I made two small alterations to the pattern. The first was to add another button to the front pocket because it kept gaping open. The second was to use metal snaps for the key loop instead of a swivel hook. I used to have an old purse from The Gap that had one of those key loops and it was the BEST THING EVER! So I'm pleased to have something similar on this bag. Plenty of room for diapers, wet bags, blankets, change pads, etc. I still have several things to sew before baby arrives next month. Obviously the bedding and chair cushions, but also a couple of nursing tops like this and this, a nursing cover (I'm shy about being exposed in public), and nursing pads. Basically stuff that I'm going to need immediately after baby arrives that I won't have time to sew because I will be in full-on zombie mode from sleep deprivation. I think I will bring my sewing machine with me to Vernon at Christmas. Hope you are all having a wonderful week and staying calm during this often hectic time of year!